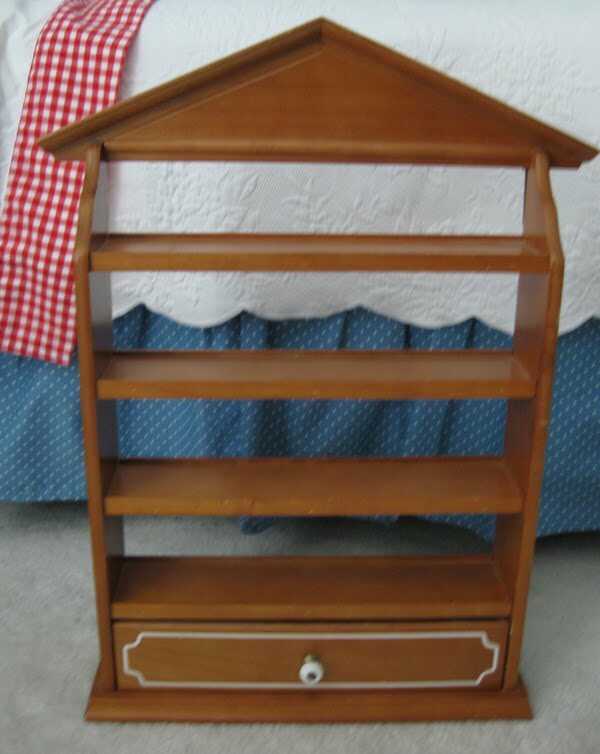 Start with a thrift store find. Well made, but not the way you envision it. Sand it down. Prime. Paint it white. Sand the edges so it looks a little worn and aged. 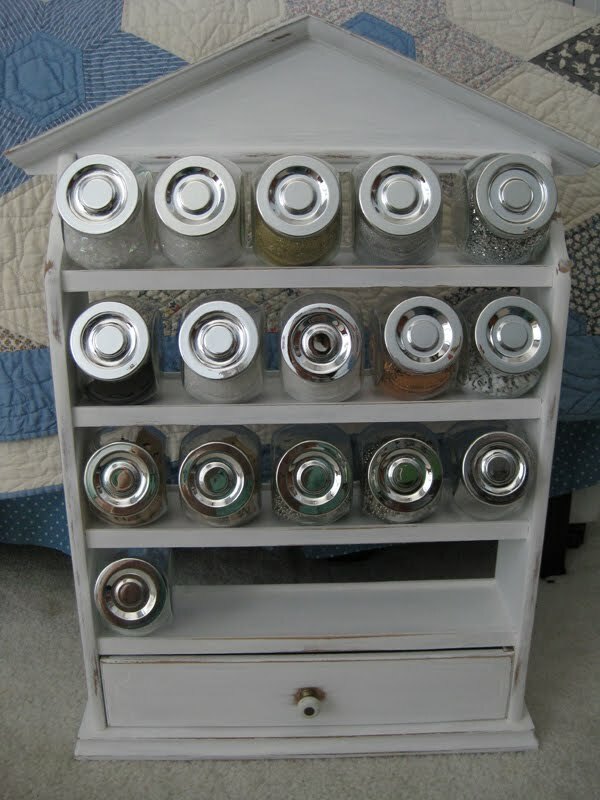 Go to Hobby Lobby and Ikea and buy spice jars. I still need 4 more. 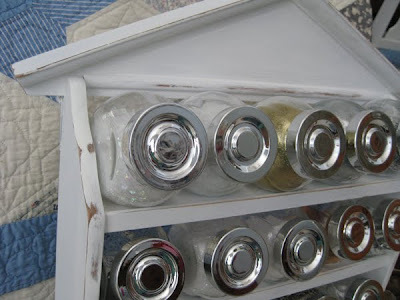 Fill with glitter,scrabble letters,more glitter and any odds and ends. 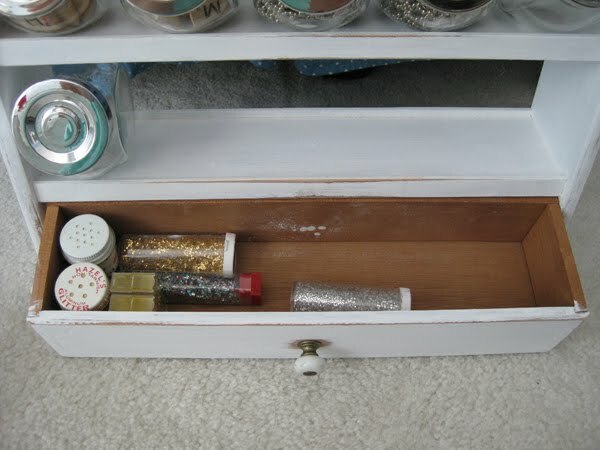 Use the little drawer for tiny bottles of what not. And you have turned a not so great find into something useful and pretty. 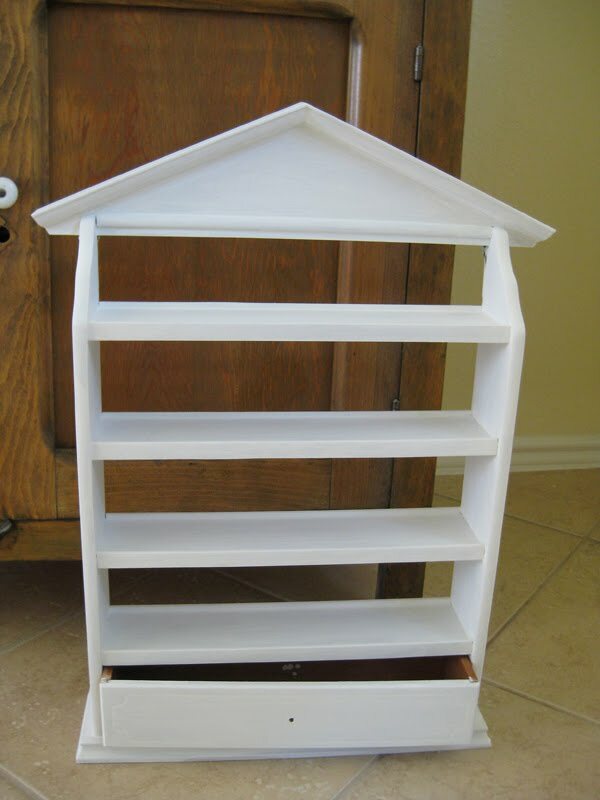 If I get tired of the white I can always add paint or a decal or decoupage a little something on it. For now I'll just enjoy. Thanks for letting me share my little project. Still over 100 degrees here-so I will be doing a few more of these indoor projects. See you soon! Cute find..and paint job..that would be pretty practical in a craft room! Headed home..in a few minute..will be on the road all night. Prayers please. This is so much prettier than shoving all of my glitter jars in a plastic bin! I'm sure this would help get the creative juices flowing better too. Thanks for sharing this great idea! You're so clever, that's a great redo! I love the jars you picked, they seem meant to go there. I'm over here struggling with my new Ikea wall unit. ACK! I'm driving myself crazy - if I've put something somewhere once, I've put it somewhere else five times!!! It seems perfect while I'm bending over, picking it up, putting it away and then, nuh uh, it's got to be moved. Over and over. climb up the ladder. up down up down. I want to throttle my own self teehee! Oh no, I'm so sorry to hear you're still roasting over there. (It was hot as oven over here on the weekend but we've had two months of cool weather preceding it.) Wishing you lots of lemonade sipping and creative fun! very cute and clever idea! 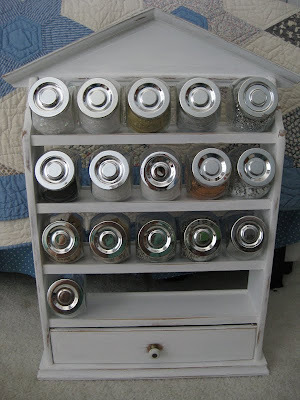 I love the little spice jars...gotta check that out at Hobby Lobby. Ikea is a 2 hour drive away. Hi. Welcome to Brookhollow Lane. I am a mom with 3 grown kids. I've been married to Hubby for over 30 years. 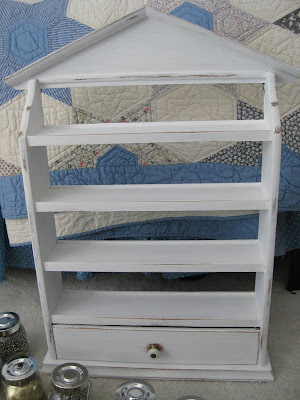 I'm addicted to decorating, anything vintage and I love to craft. I collect vintage linens,quilts picnic baskets and too many more things to mention. I'm so glad you stopped by. This is a Flickr badge showing public photos and videos from Crafty Les. Make your own badge here.